Manufacturer & Supplier of Used Oil Recycling Plant. 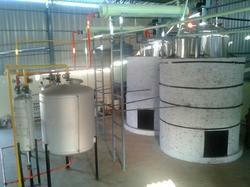 Our product range also comprises of Waste Oil Recycling Plants and Lube Oil Blending Plant. Our firm has been successfully satisfying the varied requirements of our esteemed customers by providing Used Oil Recycling Plant. We have production area with experienced team to manufacture these plants. It is highly well-liked for its flawless design, top performance and longer working life. We handover plant to customers after complete installation and taking 5 trial batches for full satisfaction of customer. Recently we have introduced Evolution 7TM Short-Path Pot Distillation Column that gives same output as WFE (Thin Film) distillation column and has no cleaning & maintenance problem like WFE. Evolution 7TM is engineered for achieving better colored distilled oil with low production cost. Our firm has been successfully satisfying the varied requirements of our esteemed customers by providing Lubricating Oil Re-Refining Plant. We have production area with experienced team to manufacture these plants. It is highly well-liked for its flawless design, top performance and longer working life. We handover plant to customers after complete installation and taking 5 trial batches for full satisfaction of customer. Recently we have introduced Evolution 7TM Short-Path Pot Distillation Column that gives same output as WFE (Thin Film) distillation column annd has no cleaning & maintainence problem like WFE. Evolution 7TM is engineered for achieveing better colored distilled oil with low production cost.